CORA stands for Community of Online Research Assignments. It is an open educational resource (OER) for librarians, faculty, and other educators. It is intended to be a collaborative space for adapting and experimenting with research assignments and sharing the success or lessons learned so that others may benefit. The site contains multiple, reliable and reproducible research assignments that do not live as isolated entities, but are enhanced by user feedback in order to build a rich corpus of best practices. There is also a Teaching Toolkit featuring a wide range of resource types including pedagogy/theory, assessment, classroom activities, technology tips, subject guides, citation tools, and information literacy tutorials. This prototype was funded from two grants provided by the Statewide California Electronic Library Consortium (SCELC). SCELC established the SCELC Project Initiatives Fund (SPIF) to advance its strategic initiatives. SCELC libraries and committees can apply for grants to plan, create, and implement projects that will have an impact on SCELC libraries and librarians. The Western Association of Schools and Colleges (WASC) includes information literacy as one of the five "core competencies" for Baccalaureate programs, along with written and oral communication, quantitative reasoning, and critical thinking. Information literacy and research skills play an increasingly important role in many university-level strategic plans. What assignments are appropriate for sharing in CORA? A research assignment is anything that requires students to engage with information resources in a critical or reflective way. This most often includes finding, retrieving, analyzing and evaluating, using and integrating, or organizing the information in order to produce new knowledge. Examples of common research assignments include a literature review, a research proposal, an essay, or a persuasive speech. We encourage the submission of both traditional and untraditional research assignments in CORA. For more information about how CORA was developed, see the Developing a Community of Online Research Assignments article. 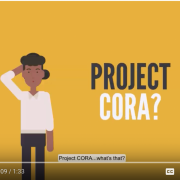 Watch the CORA promotional video for more information on CORA features and functionality.